Welcome to ADI NewsFeed, monthly inbox news and tools developed to bring you a focused look at what matters most. Unethical acts are not always or only committed by individuals intending to do bad things. Workplace misdeeds aren’t always black and white. Even otherwise honest, ethical people can find themselves on a slippery slope. 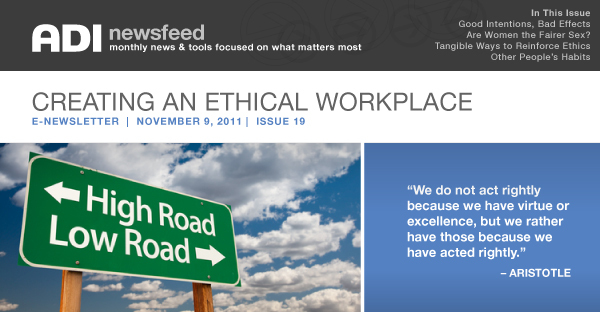 The following articles and resources will help employees and organizations create a workplace that builds ethics into their culture, systems, and practices. Look for upcoming news feeds to cover topics such as performance improvement and training resources. ADI offers a variety of programs designed to build ethical practices into the workplace. Learn More. Watch as Aubrey Daniels discusses the premise of this book, written for everyone who wants to change their own behavior and that of those around them. Watch Now.